Vision boards can be a powerful (and fun) tool to help your aspirations and goals become more REAL and tangible. The visual imagery allows you to more readily see yourself living your dream, as if it were already reality. I highly recommend using them to get clearer on what you want and to serve as a daily reminder of your vision. (Plus they are often beautiful and hey — who doesn’t want to be reminded of the things that we value and want in our lives?) We may think about what we want often, but it has a far greater impact than vague wishing. Making a vision board can be a fun and visual way of keeping your dreams in mind every day. A vision board is a piece of paper with images on it. It can be simple and hand drawn or very elaborate. Most usually consist of magazine images cut out and applied to a piece of paper. The purpose of a vision board is to help bring your dreams and aspirations to your life. Who do you want to be? What do you want to look like? What do you want to be doing? It is a creative opportunity to create your dreams on paper as a means of bringing them more tangibly into your life, a 3-D focal point for your meaningful life and vision. How to show abstract concepts? Not all goals need to be literally included on the board. The images and words just REPRESENT what you want - they serve as a placeholder for your actual items. Our subconscious mind words best with pictures - just like in our dreams. If you want a new house, OK, obviously you include a picture of a house you like. But if you want more "love" or "confidence" you'll need to be more creative with your pictures. Distill the concepts down to tangible images. Saying you want a "better" relationship is too vague. Do you want a more affectionate relationship? Show a picture of a couple hugging. Do you want a more supportive partner? Show a picture of someone lifting someone else up on a chair (you might need three images to do this). Or maybe you can find a picture of someone who seems to be supporting someone else. You could even include a picture of someone in your life or past who was especially supportive to you. Any way you do it, the intention of "support" is expressed in your board. Pay attention to how you feel. It doesn't matter so much what the picture shows, it really matters how YOU feel when you look at it. If it gives you a good feeling that is in line with your intention, use it! Even if it makes no logical sense. If one of the images is supposed to represent "success" but every time you look at it your tummy tightens a bit, find another image. I can't say this strongly enough: Don't force the board down too narrow of a path. If you are too strict in exactly what the image includes, it may not accurately represent your vision. The FEELING of what you want is far more powerful than the image itself. Not yet clear on your goals, but ready to do a vision board anyway? Absolutely! There is no reason to wait. If you aren't sure exactly what you want but you do know want more joy in your life, find images that make you feel joyful or that represent joy to you. Perhaps you fill your board with pictures of fields of yellow flowers, people dancing, or smiling faces. Maybe you haven't been feeling well and feel hazy on your goals but know you want to feel healthier. 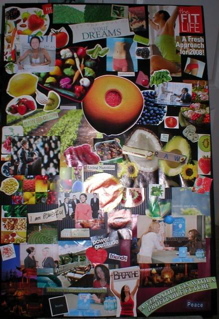 You can create a vision board full of healthy, active, vibrant people surrounded in colors that make you feel uplifted. The specific images don't really matter, but your emotions and your intentions do. Take the dream interview to help get more insights. Feel free to include pictures of yourself in it. Sometimes I take an image of someone doing something I want to do, so I print that image out from the computer, put it on my board and paste a picture of MY face over theirs. It instantly makes that dream seem more real to me as I can literally SEE myself doing it. On my last board there are a few shots of Maria Shriver's body with my face over hers at her book signing event. Anything goes! Where are good places to get pictures? Magazines are the easiest source of colorful material. You can collect them from friends, save your own, or buy old ones from your local library. Vary the types of mags you get so you have enough variety in topics and pictures to choose from. The Internet is also a great place to get free pictures for your board. In addition to regular sites, you can also go to image source websites such as istockphoto.com or Getty Images. They allow you to search by type of image (photo or cartoon, women or men, indoor or outdoor, even on themes like "confidence"), so you can really be quite particular. Copy and paste them into a document, drag them to create the size you want, then print them out. If you want more money in your future, I like to use the checks from the "Bank of the Universe" from the website for the movie, The Secret. Keeping in line with the concept of manifesting, we don't need to know all of the exact "hows" of where this money will come from, just that the world is full of abundance. I like to copy and paste these into a document, reduce the size, print out a bunch of them, fill them out, then add them to my board. Have fun. Don't worry about doing it "right," as long as you know your intentions and are clear on your goals, you are fine. You can even have some friends over to share magazines and have a vision board party! Enjoy the process and create a vision board you love looking at. The powerful visual reminder of your dreams and goals truly will help you focus on them more — and look forward to making them happen. Your unique board, combined with your heartfelt intentions and effort, helps make your dreams come true. Ready to get started and create your board? Happy crafting! Return from Vision Boards to Confident Vision Living Want to Create Your Own Business and Live Your Passion?